Here's another potentially significant, long-term benefit of the 2007-2009 recession and the "rise of arithmetic as a player in the drama" at the state level as states face huge budget deficits: it's causing states to rethink draconian drug laws, and opt for lower-cost treatment options instead of long, higher-cost jail sentences for the "victimless crime" of drug possession. Even if the main motivation is to save money, it's still a big step in the right direction of more sensible, humane and sane drug policy (see charts above). "A growing number of states are renouncing some of the long prison sentences that have been a hallmark of the war on drugs and instead focusing on treatment, which once-skeptical lawmakers now say is proven to be less expensive and more effective. Kentucky on Thursday became the latest to make the shift when Gov. Steve Beshear signed into law a measure increasing spending on rehabilitation programs and intensive drug testing. The law also reduces penalties for many drug offenses and may allow some traffickers and users of smaller amounts of drugs to avoid prison. Delaware, Florida, Indiana, Massachusetts and Pennsylvania are among those that have pending bills to reduce penalties for drug offenders, in some cases by directing defendants into treatment programs. Similar laws have taken effect in South Carolina, Colorado and New York in recent years. 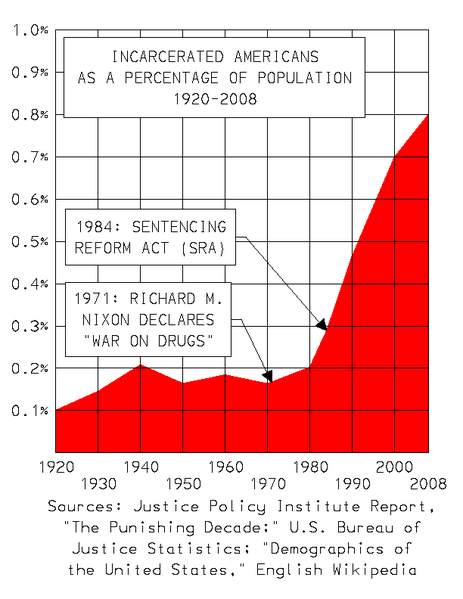 States have maintained stiff penalties for more-serious drug crimes. Although some states started rethinking drug punishment before the recession, many more states have come on board in the past two years." It is about time that the idiots rethought their stance on victimless crimes. although we are seeing historic low crime rates for serious crimes, simultaneous to taking druggies off the street...is there a lot of crossover, that is, druggies are also involved in "real" crime? A lot of college towns would lose a lot of revenue. Druggies are not any more a problem than drunks are. It is the high prices, because drugs are illegal that is driving criminal activity, not the drugs themselves. On one side dealers kill each other off and gangs fight turf wars because they want to increase market share. On the other you have users robbing little old ladies because they cannot afford the high prices that are created by the legal system's prohibition of drug sales. No it is not. Rates are falling because enforcement of drug laws has slackened as police forces figure out that they should not be bothering peaceful individuals who are dumb enough to use drugs. And as the demographics change you expect crime rates to change. In this case the lower number of young males works in favour of the crime statistics. Private security forces certainly would not waste resources with victimless crimes. You need public police to do something that stupid.